KidStart Magazine > Lifestyle > Reviews > Argos Baby Event is on! 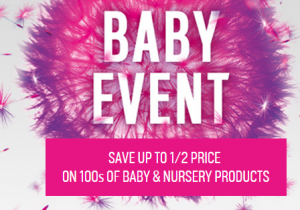 Argos have kicked off their baby event, featuring 100s of ½ price baby and nursery products. In the event you’ll discover lots of top brands including; Fisher Price, Mamas & Papas, Vtech, Chicco, Tommee Tippee & many more. From nursery furniture sets and bathing through to feeding utensils and clothing, Argos (1% back for your kids) provides a whole host of essentials to help you start your wonderful journey. Safety and security has not been forgotten, with the latest technology in baby monitors and home safety, you can easily leave your worries behind. Don’t forget the fun! You’ll find baby walkers and toys galore in the event, alongside everything you need to enjoy being out and about with your new arrival. Besides the kit, Argos has provided parents with helpful information in their comprehensive nursery, travelling and playtime guide called “Baby Steps” – filled with ever useful tips and tricks, it’s really worth a read! Whilst stocking up on your baby essentials, why not try out their new Fast track collection and delivery services? With same day delivery at only £3.95 and 60 second collection from one of their many stores, what’s not to love? Remember with KidStart you’ll receive 1% back for your kids Anna on most online purchases for home delivery.